Since we were offered a free place to stay (from my cousin) in Swiss Court Holiday Apartment Damai Laut, we planned a visit to this wonderful places (Sitiawan and Lumut) again during the recent school holidays. It’s 3D2N trip. 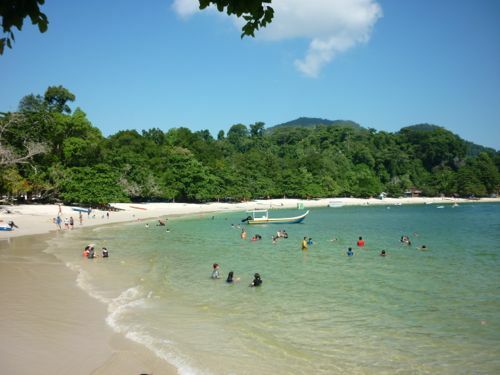 What is different this time is we included Pangkor Island as part of our itinerary. Our last visit was four years ago. Detailed write-up about the last trip here. On the way to Sitiawan, we stopped by at this stall for the second time. We ordered two servings of rice with pork, beancurd and eggs. What is unique about this is the curry topping for rice. The breakfast costs RM13.40. After the late breakfast, we took the coastal road to Sitiawan (Kapar – Kuala Selangor – Tanjung Karang – Sekinchan – Sungai Besar – Sabak Bernam – Bagan Datoh – Sitiawan). We took about 2.5 hours to reach Sitiawan from Klang. From where we came from (the Teluk Intan way), we reached Sitiawan’s Kampung Koh first. We stopped by Kampung Koh wet market for late lunch. In fact, we missed the chance to try the noodle in the last visit. This time we ordered dried noodle and assam laksa. The dried noodle is nice and is al-dante. All types of noodles cost RM3 each. Directions: From Ipoh/Ayer Tawar, turn left into Jalan Raja Omar (Kampung Koh) at the traffic lights while KFC is on the right. Turn left again at the traffic where Maybank Kampung Koh and Restoran Yee Si are located on the right. Go straight about 300-400m and the noodle stall is located on the right. 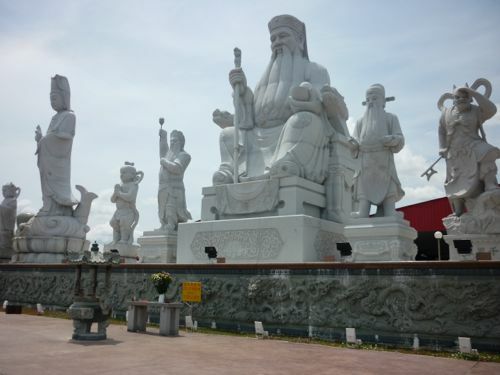 I have never seen such a huge Tua Pek Kong statue along with other gods in one location. Also it’s the largest compound for a temple. When we reached, there’s another section still under construction. According to a seller at the stall, she said the temple was founded more than 100 years ago. It’s only in 2011 that the area was expanded to include a series of statues, a food court and even a monkey park. Check out a koi fish pond and a mini waterfall behind the temple. If you want to get some mi sua, don’t get it there as you can get it cheaper direct from the factory nearby (See next section). Look for signs to this temple. Accessible via Kampung Koh and Kampung Cina. My wife wanted to check out a mi sua / mee sua 面线 (a type of fine noodle – a Foochow’s specialty) factory. One of the home-based factories is located in Kampung Cina – not far after the Chinese school if you are from Sitiawan town – on the right. We reached there about 3.00 pm and it was time for them to collect the noodles as they were dry enough and ready for packing after cooling off. 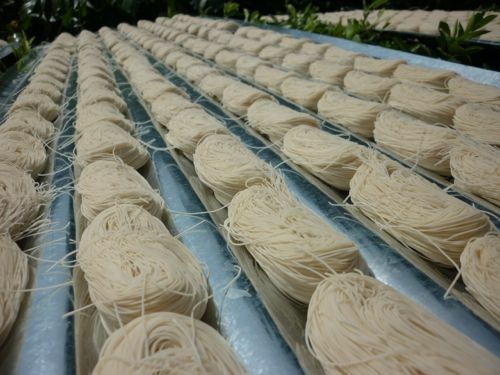 However, we still managed to see pumpkin noodles and mi sua drying under the sun. If you want to see how the make the noodles, you have to come early at about 9 am. They make noodles 7 days a week except on rainy days. We bought a few packs noodles for own consumption as well as gifts. RM8 for 1kg while 500g costs RM4. The same noodles are available elsewhere but if you buy from the factory itself, they are slightly cheaper. Even though the shop sells other steamed buns and fried noodles, we came here only for one thing: multi-layered peanut steamed buns. We had to wait for about 15 minutes as it was not ready yet. The best time to go if you are coming for this is around 3 – 3.30 pm. 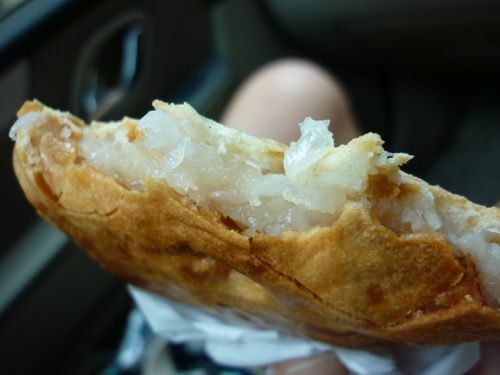 We also tried the sang yuk pau. The appearance is modest but K loves it. 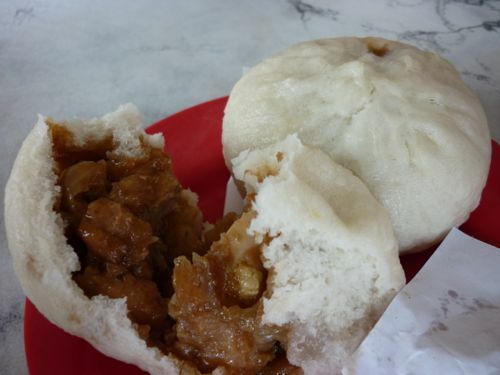 The steamed peanut buns are just fine and unique. It’s RM1 for piece. 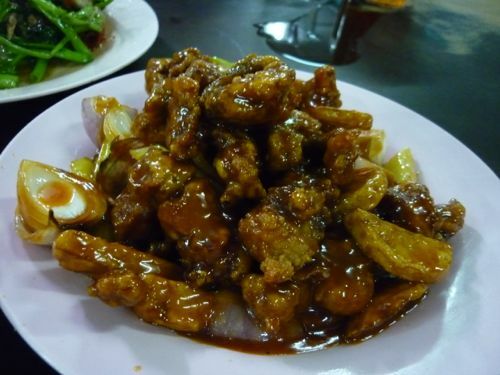 The restaurant is not hard to find as it’s along the main road in Kampung Koh – right next to Maybank Kampung Koh. 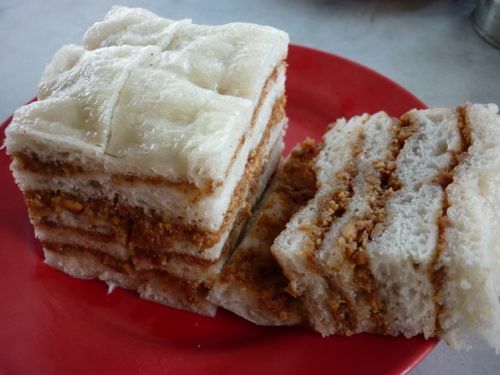 80, Jalan Lin Chen Mei, Kampung Koh, Sitiawan, Perak. Directions: From Ipoh/Ayer Tawar, turn left into Jalan Raja Omar (Kampung Koh) at the traffic lights while KFC is on the right. Go straight until you reach the second traffic light along Jalan Raja Omar and Jalan Lin Chen Mei. The restaurant is on the right, next to Maybank. 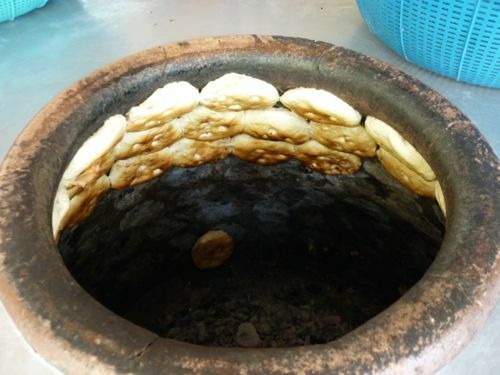 I read about this place and it’s touted as the best traditional kong piah (gong pia). 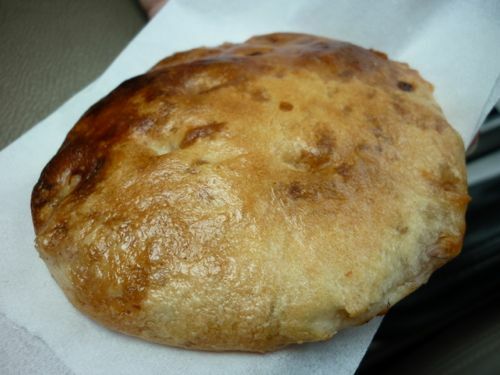 This version of kong piah here has no sesame seeds but hard, crunchy outer crust with chopped onion as its fillings. I asked a local how to get there and the traditional bakery is located along a road off Jalan Raja Omar between a tall yellow building (formerly Courts Mammoth) and Public Bank. In fact, it’s in a rather small corner behind a coffee shop. The gong pia is made there and then and charcoal baked. Hot from the oven. I guess that is what it makes it unique. And they are sold out the moment the are dug out from the charcoal ovens. You will notice a long queue there. That’s what happened when we reached and I was asked to come back an hour later (5pm) which coincidentally was the last batch of the day. But I stayed on to observe how they made the biscuits and soon they offered me 5 pieces and then another 5 from the unsold stock. So it pays to stay there if you are in a rush and if you are in luck you don’t need to queue but still get what you want. Each gong pia is RM1. It tastes really nice when it’s eaten warm. And it lives up to it’s reputation as one of the best gong pia biscuits. Though J complained the crust is hard at first but she later fell in love with the crunchy biscuits that has soft texture inside. Directions: Near to KFC crossroad traffic lights in Sitiawan. Off Jalan Raja Omar (heading Kampung Koh), between a tall yellow building (where “Courts Mammoth” used to be) and Public Bank. It is located just behind a coffee shop on the right. I made this discovery accidentally. In fact we were on the way to James Cendol from Cheong Cia Gong Pian. When we turned left by going behind the tall yellow building, my wife spotted a stall selling fighting fish and I immediately made a quick stop and parked the car. 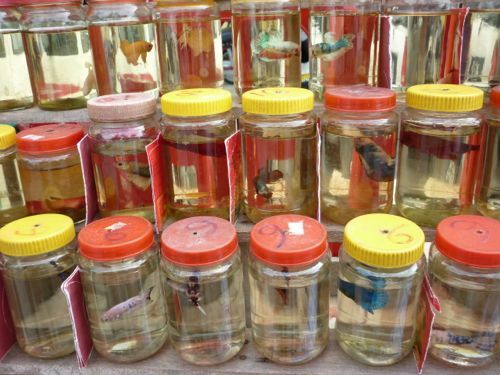 While chatting with the fish peddler about fighting fish and care tips, I also asked about the cendol stall next to his. He said that is the No. 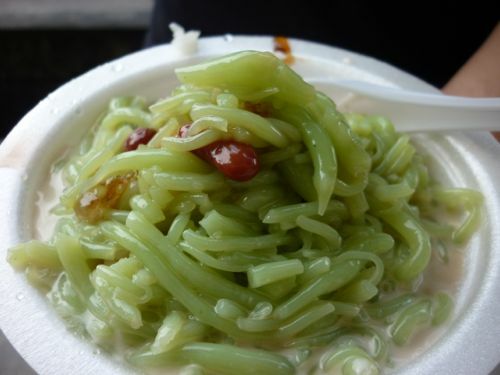 1 cendol in Sitiawan and James Cendol is placed after it – based on his humble ranking. I said to myself, “Wow I must try this!” After getting two fish from him for RM11 (each sells from RM6 onwards) and fish feed at RM1, I immediately walked over to savior Sitiawan’s #1 cendol, according to a local. I have no regrets and true to his words, the palm sugar tastes aromatic and the huge red beans are soft with an abundant of cendol serving. 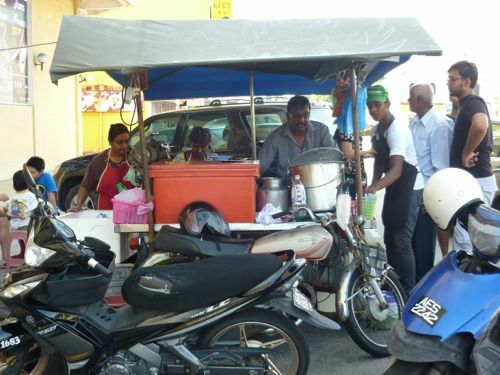 It’s not hard to see that this cendol stall has a cult following judging from the non-stop stream of customers. I am glad that I found this little gem that not many talk about. RM2.20 eat-in. RM2.40 take-away. 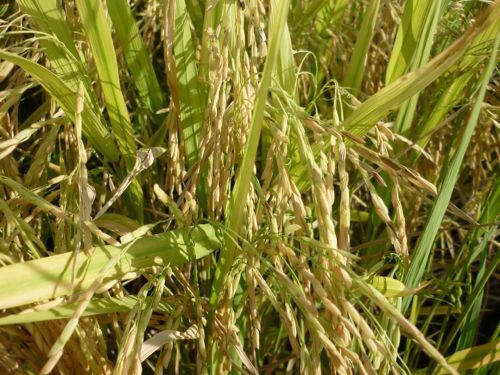 You have a choice of with glutinous rice at no extra cost. 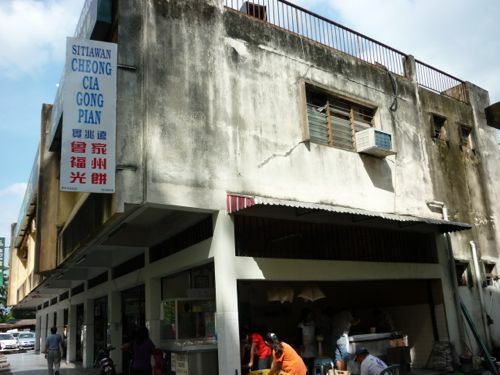 In Sitiawan, many talk about James Cendol but this stall at least provides an alternative for cendol fans. You have to give it a try as it is comparable with James Cendol if not better. While having a chat with the fish seller, the man shared with me anohter place to have nice kampua mee. (Hint: the best tip to find where the locals go for food is to ask a local where he goes for his fix for food) He told me about a shop that sells various types of noodles and Chinese desserts (tong shui such as green beans, “gandum”). We immediately went there and found a huge crowd at the restaurant. We stopped by and packed economic fried noodles (RM2.20) and kampua mee (RM2.80). The unique thing about the fried mee/bihun/kuey teow is it’s served with mixed vegetable curry. I was told the shop opens from 2 pm onwards. Directions: From Ipoh/Ayer Tawar, turn left into Jalan Raja Omar (Kampung Koh) at the traffic lights while KFC is on the right. Turn left again at the traffic where Maybank Kampung Koh and Restoran Yee Si are located. Take the first left turn (less than 100m) and go straight. The restaurant is located next to a comic book shop on the left. 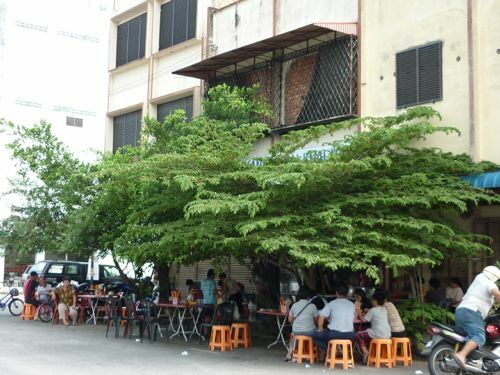 You might not be able to read the shop’s signboard as there are a few big trees lining up in front of the eatery. Enough of food. J and K were getting impatient and started to make noise that they wanted to go to the beach. We wanted to check out a beach that is lesser known than Teluk Batik. We went to Teluk Batik before and we didn’t like the beach there. Since Teluk Senangin is not far from where we stayed, it’s a good opportunity for us to drop by. Teluk Senangin is not hard to find as the signage is clear along the way. Just make sure you are in the right direction – north bound to Taiping and Pantai Remis. It’s very near to Swiss Garden Resort Damai Laut and about 30 minutes from Sitiawan town. We were happy to decide to come here. 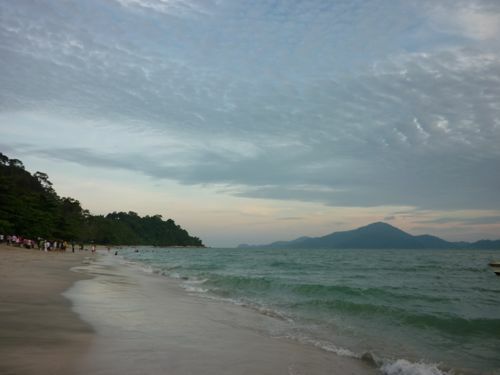 The beach turned out to be one of the best beaches found in west coast of Peninsular of Malaysia. It is a long-stretched beach as we drove quite far in to check out the beach and there are many chalets lining up the beach. It’s less crowded than Teluk Batik and more importantly, cleaner. The sand is fine. We even found a Swiss couple who have stayed there for 2.5 months who travelled all the way from Switzerland by a container trailer as their home. They like this beach for the same reason. J and K had a wonderful time at the beach and we then checked in our apartment in Swiss Garden in the evening for our first night. Half way to Lumut town (between Manjung and Lumut) we saw a restaurant packed with people. Due to natural instinct, we made a U-turn and went to the shop for breakfast. 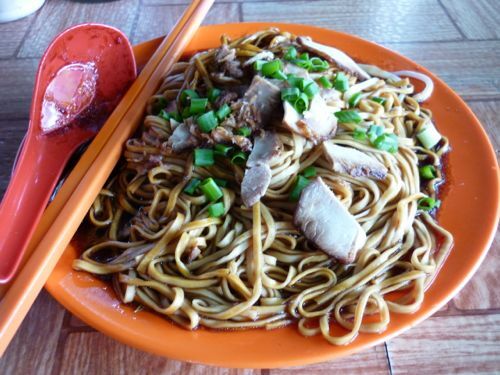 The eatery sells many types of noodle and even bak kut teh. We ordered dried noodles and some drinks. And also asked about the directions to Marina Island Jetty – a new jetty that offers an alternative ferry service to Pangkor Island in just 10 minutes! Marina Island is a reclaimed island and privately owned. 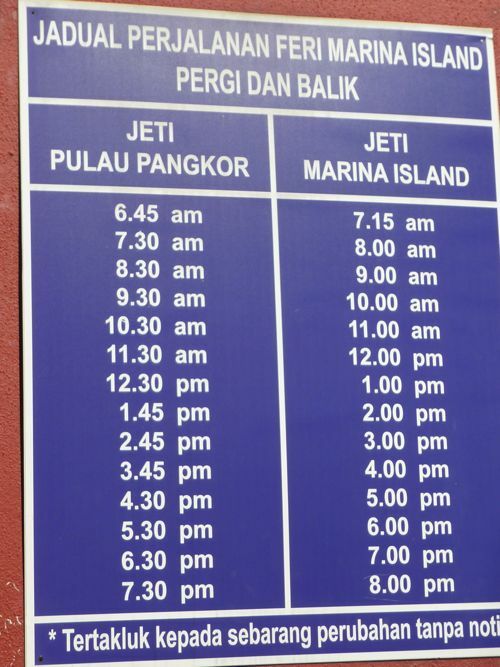 From here, you can travel to Pangkor Island in only 10 minutes as compared to 40 minutes from Lumut Jetty. To reach there, follow Teluk Muroh and Teluk Batik way. You have to make a left turn before Teluk Batik. At the roundabout after crossing the bridge, take right turn to jetty. You need to be a member (costs RM10 and valid for a year) to buy ferry tickets. You can become a member and buy tickets at the same time at the Ticketing and Information Counter. The ferry tickets cost the same as the one offered in Lumut town. But when we went there, there’s a surcharge just because it’s a Public Holiday! You can park your car next to the jetty for a highly nominal fee. I paid RM4 for 8 hours of parking. 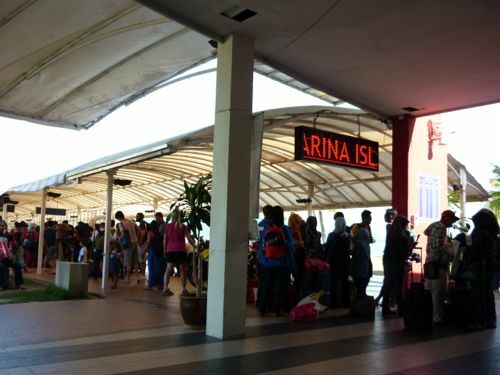 Another area of improvement is the company should setup a proper queuing system as some passengers/tourists tried to jump queue while boarding the ferry. Ferry Tickets (2 ways): Adult RM10. Child (4 – 11 years old) RM5. 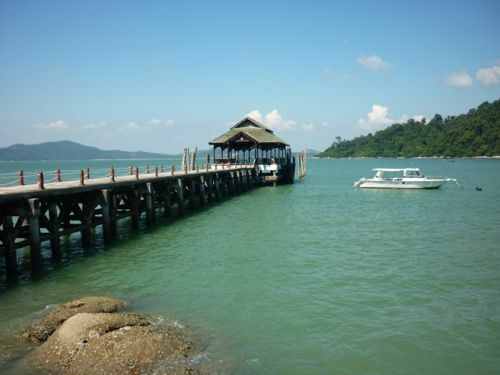 The moment you step out of the ferry in Pangkor Island, you will be approached by agents who offer rent-a-car services. What really pissed me off was, once again due to the public holiday, the rates for car rental had been doubled or tripled. For example, I was offered a car for RM120 for whole day or RM100 for 2 hours (Normal price is RM70/RM80). In the end, we rented a motorbike for RM50 until 6pm (normal price RM30/RM40). I was advised to fill up the bike with RM5 petrol and to skip the dangerous stretch between Sungai Pinang Kecil and Teluk Dalam. 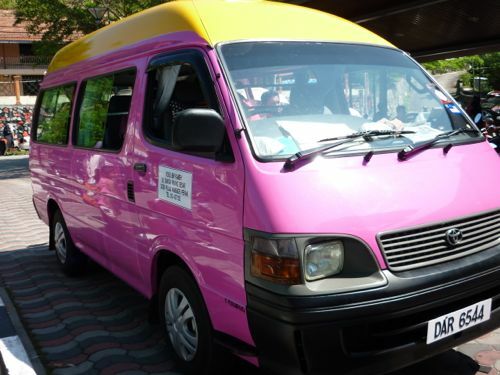 My advice to you is if you don’t want to drive and you have at least 4 or above in the group, try getting pink taxi which is a van. It can carry up to 10 persons. 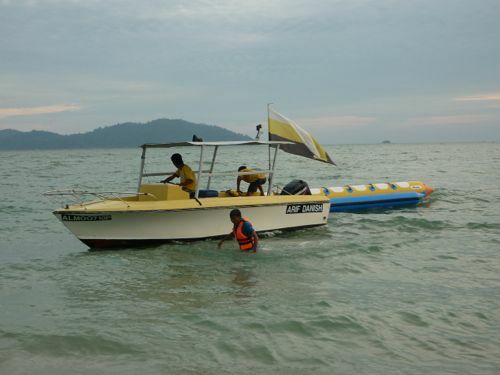 I really think the transportation service in Pangkor can be drastically improved and regulated by the authorities to protect the tourists from being cheated and taken for a ride. By the way, Pangkor Chinese speak Penang Hokkien. After checking out some fishing boats and houses in Sungai Pinang Kecil, our first stop was Hai Seng Hin Satay Fish Factory – the most popular place to get snacks that everything fish and squid. It’s the place to get the signature satay fish snacks and other dried sea produce for your friends and relatives. The shop was buzzed with people in the droves. 200A, Sungai Pinang Kecil, 32300 Pangkor, Perak. 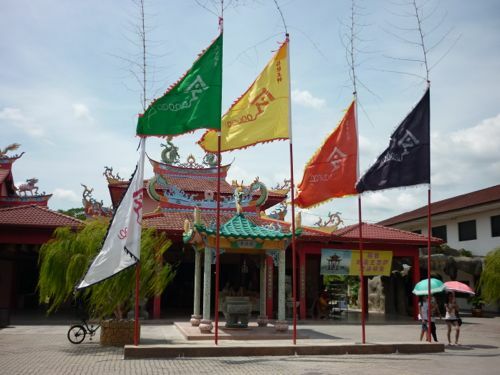 We missed the signage to this historical temple while on the way to Hai Seng Hin. To confirm the location, we asked a local the exact location. From Pangkor town, you have to turn left before the Tamil school. 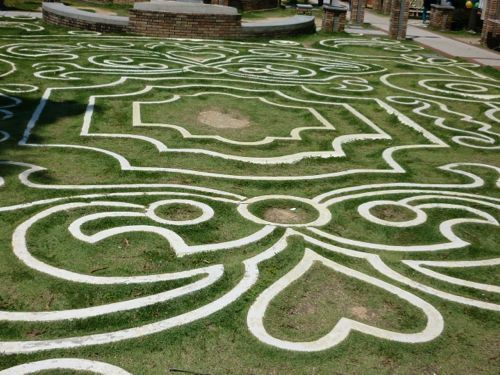 It’s built at the foot of Pangkor Hill in the village of Sungai Pinang Besar. The temple has a nice garden partly built on the hillside. There is a miniature Great Wall of China to adore. On the roof you will see the 12 signs of the Chinese zodiac. 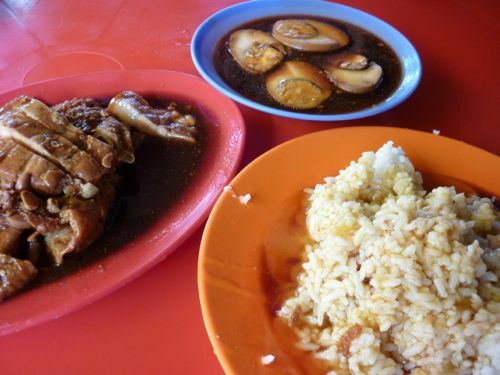 After some recommendations from pink taxi drivers, we went back to Sungai Pinang Kecil for a simple lunch. We didn’t feel like eating a heavy lunch packed with seafood. We ordered claypot tofu, siew pak choy and calamari. Overall the food is fine but we feel that we were over-charged as some dishes are more expensive than KL. The simple lunch cost us RM47.80. We also find that the staff there weren’t really friendly. 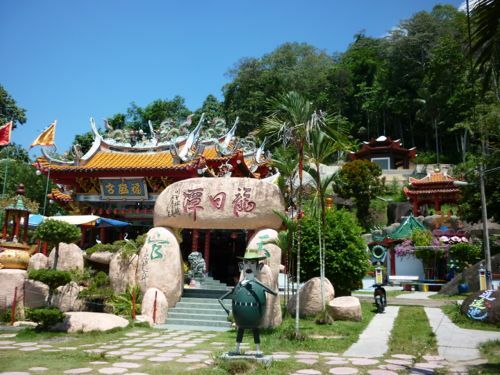 If you still want to try it out after my grievances, it’s located on the left from Pangkor town heading Sungai Pinang Kecil – in front of the restaurant there is a small temple. 423, Sungai Pinang Kecil, 323000 Pangkor, Perak. 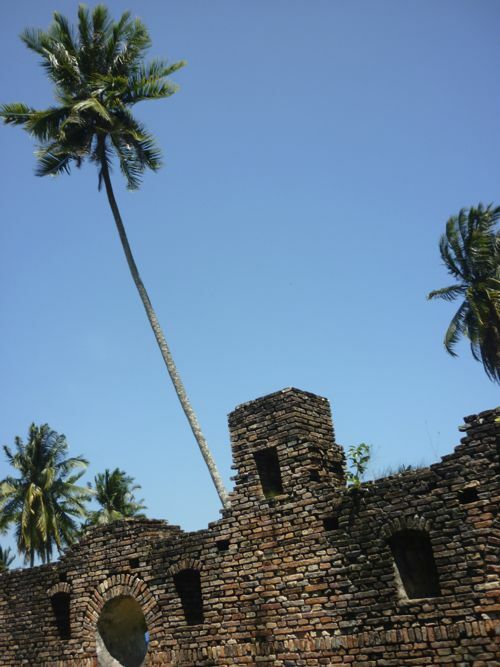 We headed south to check out Dutch Fort in Kampung Teluk Gedong – a historical site that was built in 1670 and used for storing tin. 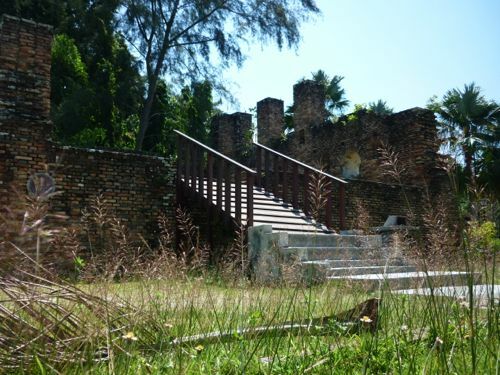 The Dutch used the Fort further as a stronghold against local Malays and pirates. Just a short distance away (about 100 m on the left) from Dutch Fort, there lies a giant boulder next to the road that signifies a legend. I can still remember this stone which I saw about 20 years ago. 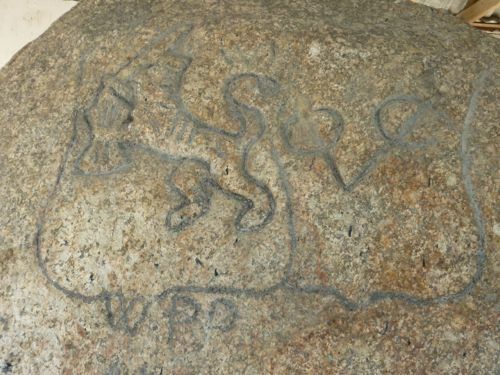 It has an inscription ‘1743 I.F.CRALO’ and the initials ‘VOC’ (Veerenigde Oostindische Compagnie – The Dutch East India Company), and the image of a tiger. The boulder is covered by a pink roof. We made a turn back and heading town after Tiger’s Rock. 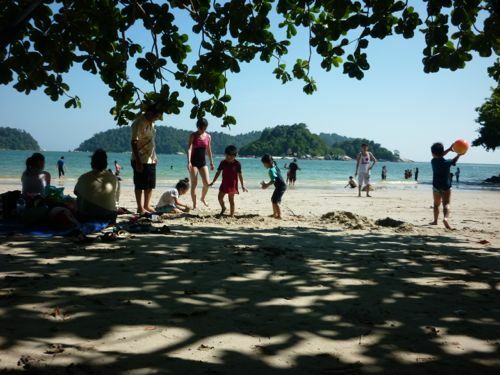 To go to beaches on the west side of Pangkor Island, you have to turn left before the town. We rode all the way to Teluk Dalam and Pangkor Island Beach Resort Jetty. The wind was blowing strongly and it was a quiet place to relax and enjoy the crystal clear green sea. Since J and K wanted to go to beach again, we picked a spot near a Chinese temple in Coral Beach / Coral Bay – a few kilometers north of Teluk Nipah – overlooking Pulau Giam. I must admit that I am impressed with the cleanliness of the beaches here. The water is clear and the beach is clean. 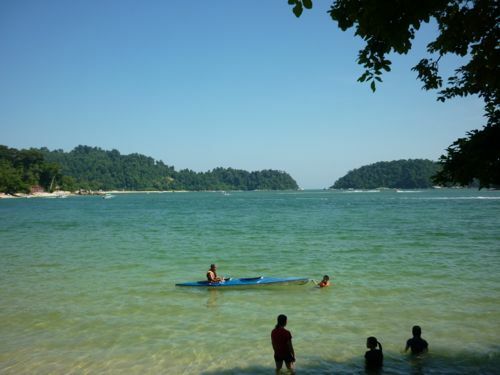 In fact, you won’t go wrong as long as you are on the west side of Pangkor Island. Coral Beach is slightly secluded but if you like somewhere which is more crowded, head to Nipah Beach. There are many stalls lining up both sides of the street and is more crowded. If you love beaches, you must come here! We handed the motorbike back to the operator at about 5pm and took the next ferry to go back to Marina Island, Lumut. I heard of this place but never got the chance to see it for myself. The Royal Malaysian Navy Base is located at the end of Lumut town. We were approached by the guard when we tried to take a photo of the main entrance. After explaining to him we are Malaysians, we were allowed to proceed. The beach near RMN is clean and less crowded. It’s definitely a better choice than Teluk Batik if you feel like going to a beach in Lumut. If you have time, you can pay a visit to Lumut town as there are still many old shop houses around and great place to do some shopping. We wanted to try out something different for dinner. 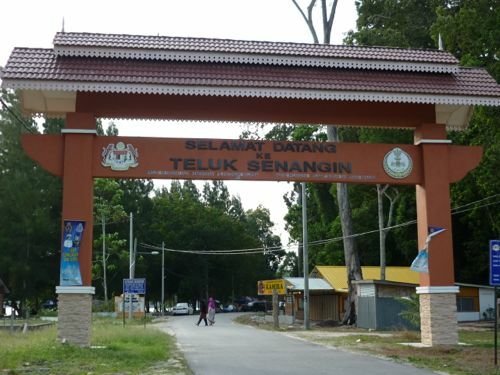 We decided to go to Ayer Tawar, town – which is 20 minutes away from Sitiawan. 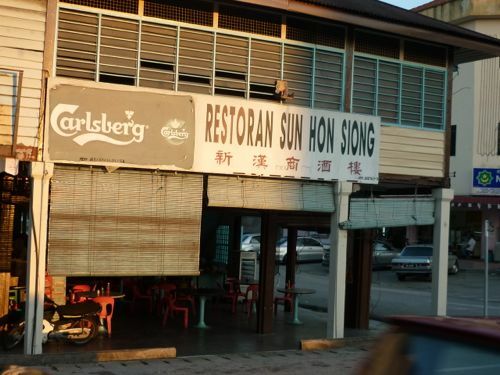 The destination: a restaurant called Sun Hon Siong. 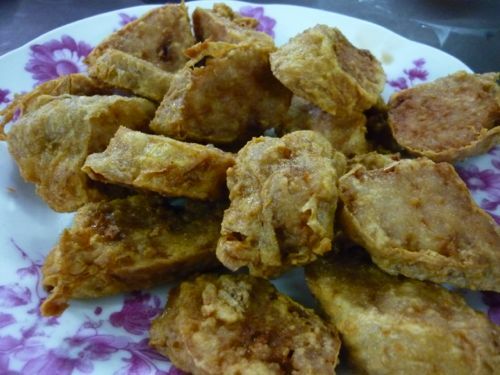 The famous dish is sweet and sour pork rib. You can order the dish prepared together with fish fillet. Besides that we ordered belacan kangkung, Foochow fried spring roll, and seaweed soup. The dishes are generally above average. 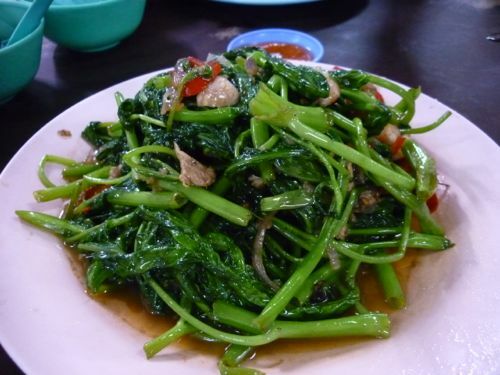 I like the kangkung most. Similar to Sitiawan, the Chinese in Ayer Tawar speak Foochow. If you are fussy with cleanliness, you might have to skip this restaurant as it is not a 5-star restaurant in cleanliness. 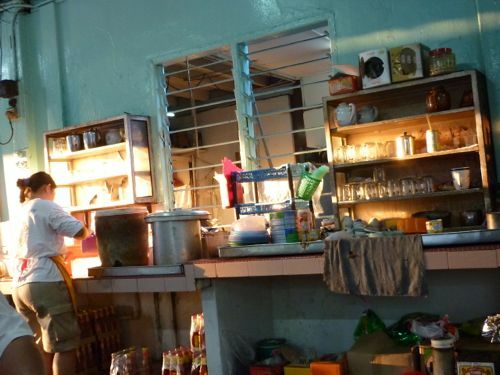 But then again, most restaurants in Sitiawan are in similar condition though. 142, Main Road, Ayer Tawar, Perak. Directions: Opposite of Public Bank in Ayer Tawar; same row as Hong Leong Bank – A small town you will pass by before you reach Sitiawan from Ipoh; along the Lumut highway. 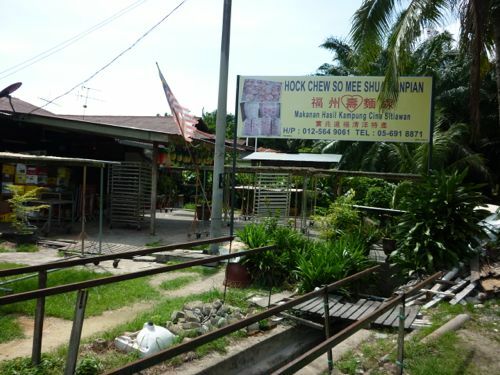 The restaurant is located on the end which is nearer to Ipoh. Before checking out, J, K and I had a splash in the swimming pool. We really enjoyed the dip there though the swimming pool is littered with dried leaves from the plants nearby. We have been to this wonderful place 4 years ago. The signage has not improved ever since and we made a right turn thinking it was the wrong way as there are many farms (huge ones!) built near the sanctuary. When we reached there about 1 pm and the weather was really hot. 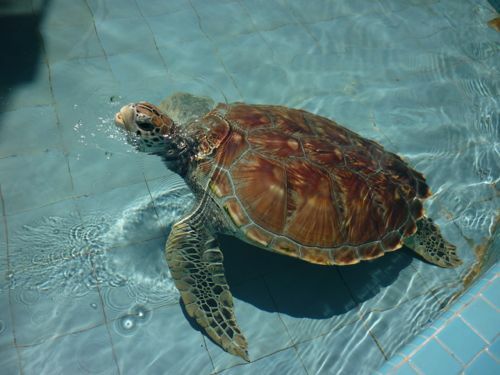 Despite that, the turtle conservation center was packed with curious visitors. The center remains the same as it was 4 years ago. No changes. The sanctuary opens 7 days a week. Read more about the center here. If you happen to be in Pantai Remis, check out the fishing village behind the shophouses on the main road – on the left if you are from Lumut/Sitiawan. With special instruction from my wife, while on the way back home, I had to make a stop in Sekinchan for a photo session of its highly popular paddy field. The paddy is riped for harvest and the huge area has turned into golden field – like it’s painted with gold paint. 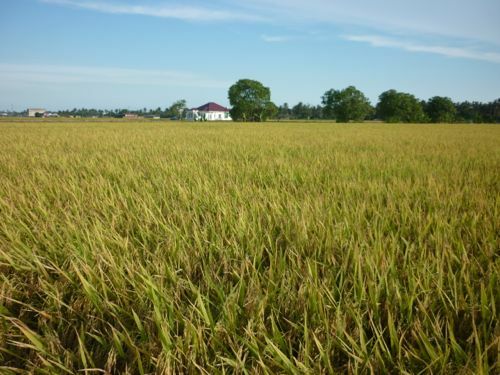 You can stop your car in the middle of the paddy field and walk about to have a close look at the paddy. And of course, take lots of pictures.